Photo credit: Matt Butler. Description: Amanda Kirchgessner, a candidate for New York State Senate, has been accused of domestic violence by her ex-wife. 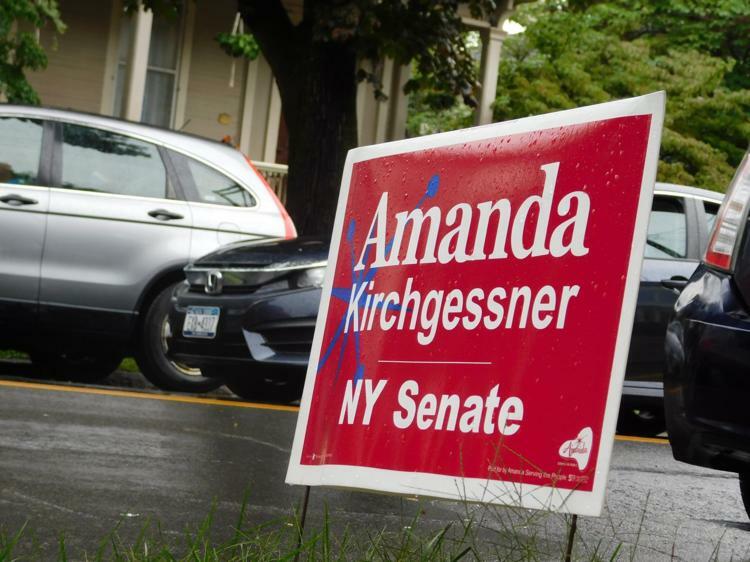 Matt Butler from the Ithaca Times reported this week that State Senate Candidate Amanda Kirchgessner is being accused of domestic violence by her ex-wife, Brandi Morgan. He spoke with WRFI’s Laura Rosbrow-Telem on ‘Your Morning‘ about the piece. Later in the show, Amanda Kirchgessner responded to the allegations. This conversation first aired on Oct. 5. *Nic Belott assisted with the transcript below the audio. Laura Rosbrow-Telem: We’re here with Matt Butler from the Ithaca Times. He broke a big story this week. State Senate candidate Amanda Kirchgessner is being accused of domestic violence by her ex-wife Brandi Morgan. So Matt, first welcome to the show. Matt Butler: Hey thanks guys. Thanks for having me. Laura Rosbrow-Telem: So tell me about the moment Brandi Morgan got in contact with you. Matt Butler: Well Brandi, it was not actually the first person to get in contact with us about the story. There was a person who wished to remain anonymous who got in contact with us before the primary and who made it very clear that if Amanda was to lose in the primary, they had no interest of going forward with the story because Amanda would return to being less of a public figure than she is now. But as it turned out, Amanda, you know, smoked Michael Lausell in the primary. And then that’s when they decided to come forward, when the wheels really started to turn was basically the day after the primary, that Friday. Laura Rosbrow-Telem: Well OK so just to be totally clear, you had an anonymous source get in touch with you about this before the primary election and this was beyond Brandi. Matt Butler: That’s correct yeah. Laura Rosbrow-Telem: OK. That’s interesting. So then. OK. So then the primary election happens and Amanda wins and then what happens? Matt Butler: Then we sort of reinitiate contact with the anonymous source. They come into the office. We do the interview there and then we get in touch with Brandi and she comes in later and you know that’s really where the meat of the story comes from. Obviously it’s going to be something on an anonymous source. But that’s where the wheel, I guess, really started turning was, was when Brandi came in later that week. Laura Rosbrow-Telem: And so then what happened? Matt Butler: She gives us all the information that you see in the article pretty much. There is some stuff that isn’t in the article because it couldn’t be corroborated, but she puts the stuff in the article we thought it was pretty legit. She shows us the tape recording that you see the transcript of in the article as well as some pictures from after some of the physical incidents. A police report. I think it’s called the domestic violence incident report registered with the New York State Police showing one of the incidents between her and Amanda and she gives us permission to use her name, which obviously we’ve been doing. And then we just work about starting to corroborate and confirm all the stuff that she gave to us yeah. Laura Rosbrow-Telem: So can you tell me about the instance that you mentioned in your article for everyone who’s listening who may not have read the article. Matt Butler: Sure, yeah. Well if you haven’t you should read the article. But also there are about four main incidents of physicality, I guess, I would say that Brandi brought up to us, the first of which was in November 2014. They had been married for about six years at this time. And she said that during the summer of that year, their marriage had started to sort of deteriorate, I guess is the polite word. And in November was the first time she said it ever turned physical, which was when in Brandi’s story she– Amanda, during an argument, sort of dislodged some part of a dog gate that they had on the stairs and threw it down the stairs at Brandi who was also on the stairs. It did hit Brandi but she was not seriously injured, she didn’t fall down the stairs or anything. So she chose not to go forward with that story or you know go forward to the police or anything like that. And then it sort of progressed from there to, to frankly more serious incidents I think yeah. Laura Rosbrow-Telem: Yeah. So can you tell me about those. Matt Butler: Yeah sure. So the second one was one in which I believe. Well Brandi isn’t sure how this one started. She isn’t really sure how some of these incidents have started but she said that Amanda cornered her in their bedroom and sort of pushed her down onto the floor and tried to, try to remove her pants and said at some point or another that she wanted to choke Brandi to death. Matt Butler: Now Brandi says afterwards when confronted about this, they said it was more sort of I would say this that was meant to be more of a romantic thing in some way, and I don’t want to get into that at all really. But but that was the defense. That’s what’s been said so. Matt Butler: So yeah moving beyond that. There was another incident in which Brandi had taken Amanda’s phone and Brandi says that Amanda to get the phone back grabbed her sort of by the maybe the scruff of the neck or the hair of the back of her head and pulled her backwards which sent Brandi to the ground. Matt Butler: And Brandi–now there’s no proof of this part. This is Brandi’s belief, purely, but that the neuro-stimulator that is implanted in her spine to help with complex regional pain syndrome to help with that she oh the neuro-stimulator was rendered defective essentially by this incident, that she has had to have it removed and another one implanted and then moving on from that. Matt Butler: There was another incident, this is the one that there is an actual police report about, and I believe this was actually after divorce proceedings had started, initiated by Amanda. But they were still technically married. And during this one, Brandi and Amanda are in an argument about Brandi’s new romantic partner and Brandi sort of starts to, I think yell out the window for help. And Amanda, according to the police report, sort of grabs her and pushes her away from the window and we have a picture of a bruise from that incident that we didn’t use but the picture was provided of bruising from that incident, although it also should be made clear that was not in the police report. Brandi did not mention those injuries at the time of the report. Laura Rosbrow-Telem: Yeah and I guess after this window incident they did call 911 and there was like a police report about this specific incident? Matt Butler: Correct. Yeah. Yeah there was a police report filed. There was, no this was through the state police, I believe, there was an incident about two days prior that Tompkins County sheriffs responded to. But seemed to be more just domestic in nature. And this follow up argument was tangentially related to that incident but that incident, the first instance to remain fairly peaceful. This one on June 27th, 2015 was when things turned physical. Laura Rosbrow-Telem: And just again to be really clear all the incidents that you’ve just mentioned were corroborated by two other people. Basically people that were in Brandi Morgan’s life who she talked to about the incidents shortly after they happened and her fear about them. Right? Matt Butler: At least two other people. Yeah there was for that final incident. We corroborated it with three other people actually. We just didn’t use the third person’s corroboration necessarily in the story but we had two sources at least on two sources and Brandi on all the everything that was reported had two sources and Brandi. Laura Rosbrow-Telem: Right. Right. And I must say the other bit of evidence that was particularly disconcerting was this tape recording. Can you talk more about that? Matt Butler: Yeah the tape recording was made I believe two days after the incident in which Brandi was you know thrown to the ground allegedly I suppose but it was two days after Brandi was thrown to the ground and over the phone incident. And pardon me you can hear on the tape they’re sort of having a discussion about just sort of normal couple stuff. You know something was under a laptop I think. And that’s when Brandi who is making a tape recording without Amanda’s knowledge which I should say is legal in New York State. That’s when she sort of starts to confront Amanda about the things that she says have happened to her physically which are you know things like the taking off the pants, things like the verbal threat to choke her to death, things like being thrown under the ground over her phone. And you know Amanda will not admit to these openly certainly does not object to that telling of events I guess I would say. I think the exact words are well you still wanted to be with me. And then Brandi responds that I don’t want to be with you and Amanda says well you still did at that point and that was, that was a fairly big factor in our reporting as well that we felt like that was you know maybe not a full throated confirmation. It certainly wasn’t a denial. Laura Rosbrow-Telem: Right. And specifically I’m just going to read the transcript. Of this specific part. Matt Butler: Oh please yeah. Laura Rosbrow-Telem: So Brandi says, “You should never ever react toward someone physically. You threw me to the ground. You pulled my pants off. You told me you wanted to choke me to death. You took my phone away and now you grabbed the back of my head and pulled my hair out to get your phone.” And then Amanda’s response to that is, “Well you still want to be with me.”. Matt Butler: Right. So yeah I mean I’m with, it’s a, you know, I in my mind, at least, that signified if someone had said that about me. I would have objected pretty strenuously and I can’t really you know, put my sensibilities on anybody else. But that seemed like a pretty normal response to, to object to something like that. Laura Rosbrow-Telem: Right. For our listeners out there, you have been listening to a conversation with Matt Butler from the Ithaca Times. We are discussing his report this week about alleged domestic violence that Amanda Kirchgessner perpetrated against her then wife, now ex-wife Brandi Morgan. And just quickly before we get to a music break, I want to ask you just as a person, as a journalist, how did you feel reporting the story? Matt Butler: Well it’s uncomfortable. It’s frankly, this type of story that you hope isn’t true. Right. I’d be happy if there was one less domestic abuser in the world. And I’d be happy if there was one or two less people who felt that they were domestically abused or in a domestic abuse situation. But you know when you have that level of evidence and Amanda is a public figure running for office. And regardless of, you know, what you think of her chances are anything. That’s come up a couple of times, people say, well, she’s you know she’s mounting more of a grassroots campaign. Maybe this isn’t worth sinking that for. Matt Butler: But I disagree. I think voters should have all the information they can get. And if there’s a future election and this came out at that point, I think people would feel betrayed that they didn’t know about this. I’ve already had people angry that this didn’t come out before the primary. There’s not much I can do about that but I can understand their anger. Laura Rosbrow-Telem: And just a last question before we get Amanda into the studio, Jezebel also reported about this and one interesting thing that they noted was before all of these incidents occurred, Amanda had expressed a desire to open the marriage. And in any case, Jezebel mentioned this and I noticed that you didn’t. Why didn’t you mention it? Matt Butler: We had been told that by a couple of sources that felt like that just felt like something that was sort of beyond the pale, that didn’t need to see the public light. You know we can leave that to you know… Not that it was bad that Jezebel reported that or anything, but that just felt like something that the Ithaca Times can leave alone. You know if Jezebel wants to go after that they can go after that. Laura Rosbrow-Telem: Any last comments? Matt Butler: No no I don’t. I know we– well we will hear from Amanda and she’ll say what she has to say. But I think we we did our due diligence reporting. I feel comfortable with the story and thanks for having me on. I appreciate it. Laura Rosbrow-Telem: All right. Thank you. Thank you very much for being on the show. You just heard from Matt Butler from the Ithaca Times talking about allegations of domestic violence against state senate candidate Amanda Kirchgessner. We’re going to a very short news a break and then you’re going to hear from Amanda Kirchgessner herself. She’s going to share her side of the story. So stay with us.